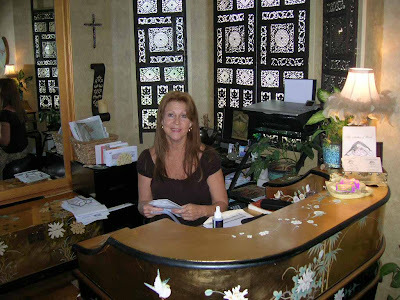 Terri at "The Mother of Pearl" is an amazing healer/masseuse/reconnection worker/crystal healer and all round goddess and I go to her for esoteric healing and massage in Murrieta, California. Terri not only works on my body, mind and soul but she is teaching me so much about what it means to be a spiritual healer, a beautiful woman, and an inspirational teacher. Terri is a true healer, she works from love and with integrity. She knows what it means to value herself and her work. She is an explorer who has been guided by intuition for much of her life. It has guided her to live at the pyramids, to swim with the dolphins, to live with the nuns and give readings and to give up all her belongings while traveling so that she could fill her suitcases with shells collected at the beach. She is a leader of women, and a mentor and guide to all who cross her path and I am honoured to know her. You can read another blog article (with pix) about my session with Terri here.